People are often afraid of making meringue. 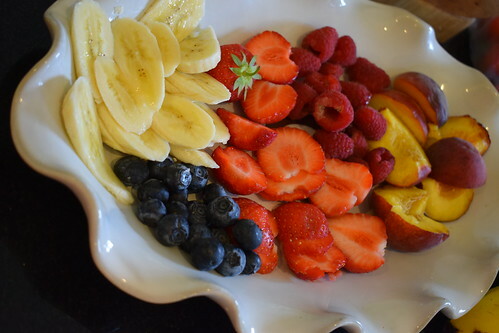 I find it a super dessert to make in advance. 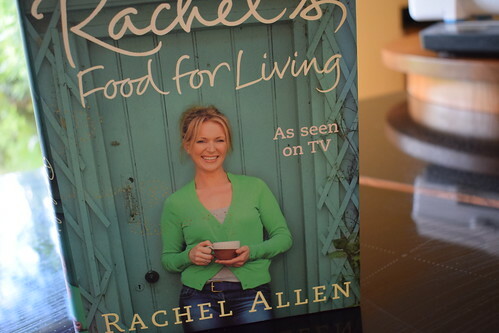 A good friend of mine, Emily, had told me about a Rachel Allen recipe that basically just flung everything together and whisked the bejasus out of it. 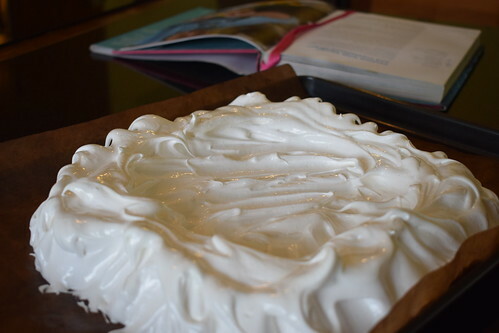 And I often make meringue the “meringue girls” way too. 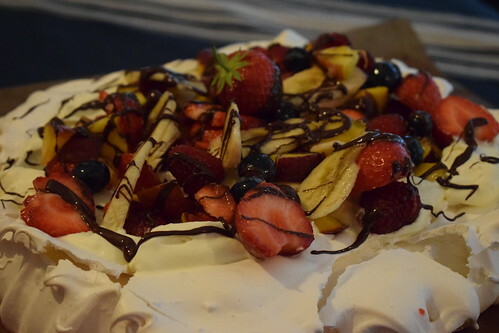 But this recipe is specifically for pavlova. And works every time. I always use my stainless steel kenwood bowl for this job. I’ve never made it by hand but can’t imagine it would be easy, unless you’ve popeye arms. 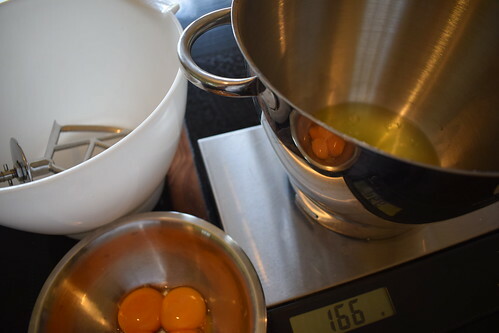 The secret is to put everything in the bowl, with some hot water, I think the hot water is almost the equivalent to making meringue the Italian way. 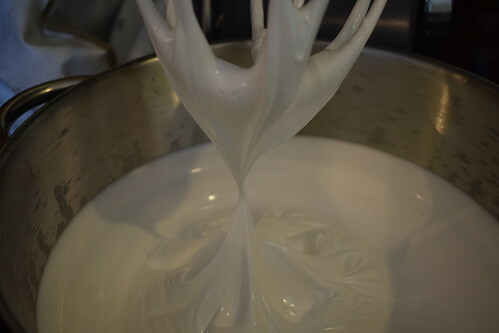 Then it’s whipped on high for 5 minutes until the sugar is dissolved and the egg whites are holding their shape. The other secret is the oven setting. Although Rachel says you can use a fan oven, this recipe works best I feel when using the conventional one, as she suggests. You simply heat the oven, on conventional, to 2000C, then simply switch it off when you put the tray into the oven to bake. This means that you can make it last thing at night and simply walk away. Mind you, be careful not to come down in the morning to turn the oven on again before taking the masterpiece out! The last thing to add is the topping. Rachel suggests Mango and crystallised ginger. I don’t always have a ripe mango to hand- who does?- so I go with a mixture of what fruit I have in the fridge. And as this was a special dessert, I melted some chocolate to spoon over the assembled dish. I only have two children, lots of nieces and nephews, but only two of my own. So there’s only a requirement for 3 extra special birthday cakes a year. Believe it or not there’s a lot of pressure. And actually multiple cakes, as there’s the cake on the day, then “the” cake on the day of the family party, and sometimes there’s a third cake, depending on what other celebrations are in order. We have a real thing for lemon curd in our house, and meringue, and sponge. So together they made the “day” cake yesterday. Its not the fanciest looking cake, but the flavours work really well. The addition of cream makes it luscious. And it was certainly polished off quickly, in the garden with afternoon tea. Of course, its always nice to have a candle to blow out, and we went out for pizza in one of her favourite restaurants- Emiliano’s in Waterford, and where the addition of the candle to her crunchy cheesecake, made for one very happy newly minted teenager. Even though I have been incredibly lucky to spend three months living the dream on the Ballymaloe Farm, I very much appreciate living on our farm. At this time of year especially. All the teachers were so passionate about using locally grown ingredients that I feel its only right to continue my studies in our own garden, this time I was foraging from veggie garden! As we were hanging out washing on Alan’s line I decided to pick some veggies for dinner and our smoothies. As the bees have once again taken up residence on the deck, our washing line will have to be relocated, and we haven’t decided where to yet. The sea kale is nearly ready under it’s terracotta cap, and the rhubarb is coming up nicely, lovely pink flesh. This meant we had to postpone the -no puddings during the week – rule, and use the rhubarb to make a triple layered meringue cake. I love to gently poach it in lots of caster sugar, and the tiniest spoon of water. Meringue was the chariot of choice for the rhubarb, as I was using the yolks to make carbonara for dinner. The nutribullet is working out well, and when I have perfected a few more smoothies I’ll share my favourites, and it is a great way of injecting the family with fresh veg in seconds. The purple sprouting broccoli is so addictive, at this time of year I serve it with everything! The carbonara was really good, and is a firm family favourite, and is so quick. And then dessert, don’t mind if I do. I was waiting for this past weekend for what seems like a lifetime. In fact it was really only 5 weeks. My eldest was returning from his time in Bolivia and Peru. Nigel brought him back on the last leg from the UK and he arrived back early Saturday morning. Although a little jet lagged, he is in great form. I was VERY glad to have him home. Not a great picture, but you get the jist! So we had decided to have a family party to celebrate his return, his belated 16th birthday, and Jordan’s 12th birthday. It was a great weekend for it, we started in Kevin and Pam’s house Saturday for pizza night. Pam’s Uncle and Aunt from Canada are staying too, and were delighted with all the commotion! Then we went orienteering in Kennedy Park Sunday morning, it was the official opening of the permanent Orienteering course, and the prize giving for last seasons league, Jordan winning the Light Green. As an aside, I’d a DREADFUL run, hoping I can improve before the Vets! Then last night the dinner party. I didn’t do starters (too many kids not wanting to wait for dessert), so had very slow cooked beef cheek and venison in oodles of red wine, served with creamy mashed potato, carrots and peas. Liisa very kindly made the aubergine dish, and Sue brought a fresh salad. A meringue surround, filled with a vanilla sponge base, and a milk chocolate and white chocolate mousse layer, topped with strawberries. Pam made the most amazing apple and plum crumble, and Jordan had made her cookie dough brownies.